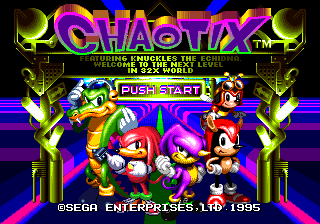 Knuckles' Chaotix prototype 0214 for the Sega 32X was released by drx during the February 23rd, 2008 proto release. Its compile date is Feb 14, 1995. NOTE: To play the prototype in Kega Fusion v3.6 and up, the "Fast 32X Timing" option in the 32X configuration tab must be enabled. For older versions of Kega Fusion, a special release, which can play the prototype, was made available here (info) (268 kB). This page was last edited on 20 April 2018, at 12:04.